The dust has settled on the NHL’s transfer window, and it was by no means exceptional but there was still a mix of good/questionable/WTF trades made over the days leading up to the deadline on Wednesday. Many GM’s have complained that the upcoming expansion draft has left teams wary of big trades, but their phones were still pretty busy. Here are some of the trade winners. The Caps are the strongest team in the league, but that regular season success never seems to translate to the playoffs. On Monday the team firmly nailed their colours to mast by acquiring blueliner Kevin Shattenkirk and goalie Pheonix Copley from the St. Louis Blues. The trade wasn’t purely one-sided, the Blues got Zach Sanford, Brad Malone, a first round 2017 pick and some conditionals. This trade was a major coup for Washington, not only have they bolstered their own defence with the experience of 28 year old Shattenkirk, they’ve also denied the rest of their rivals access to probably the best player available at the time. Shattenkirk had 42 points with the Blues before being traded. Johnny Oduya is no Shattenkirk but he’s a great addition to Chicago’s defence, and already has a Stanley Cup ring from his first stint with the team. What makes the ‘Hawks winners is that they gave up naff all to get Oduya. Even if Oduya is half the player he was when he won the cup, the ‘Hawks still win. The Stars got AHL-er Mark McNeill and a conditional draft pick in return, and they retained 50% of Oduya’s salary. McNeill is a former first round pick and nobody was interested when he was placed on waivers earlier at the start of the season. The Blackhawks also picked up 24 year old Tomas Jurco from Detroit, giving up a third round draft pick to secure the forward who has zero points this season in his 16 games with the Red Wings. The Penguins may be favourites to lift the Cup, but GM Jim Rutherford still had some work to do to take the pressure off his defence. That support came in the shape of Tampa Bay’s Mark Streit and Toronto’s Frank Corrado. Pittsburgh gave up a 2018 4th round pick for Streit, and Eric Fehr, Steve Oleksy and 2017 4th round pick for Corrado. Streit had been traded to the Lightning earlier the same day by the Philadelphia Flyers. The 39 year old defenseman hasn’t exactly endeared himself to the Flyers faithful, mostly because he’s not a very defensive player; an important trait in his role. But he does assist on a lot of goals. So the Pens can rely on him to get the puck forward. Corrado has played 69 NHL games since 2012 and has only played twice this season for Toronto. But he’s only 23 and he has the potential to develop. Ron Hainsey was traded to the Penguins back in February for Danny Kristo and a 2017 second round pick. Along with Streit and Corrado, the Pens’ blueline has done well out of these trades. Canucks GM Jim Benning is reknowned for his inability to trade well, but as the rebuild continues he traded dead weight Alex Burrows to Ottawa for immediately extending his contract for a further two years! Vancouver got Jonathan Dahlen in exchange. Jannik Hansen was also traded to San Jose for Nikolay Goldobin and a conditional 4th round pick. 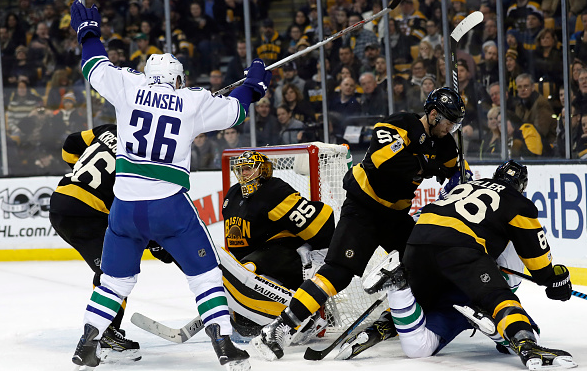 The Canucks are winners not because of who they brought in, but who they got rid of. Despite the handicap of playing for Colorado; Jarome Iginla scored his 600th NHL goal earlier this season but is yet to lift Lord Stanley’s Cup. After expressing his desire to play for a good team, the Avalanche obliged and reunited Iginla with his former coach Darryl Sutter in exchange for a conditional 4th round pick. The Avs aren’t winners because they traded Iginla. But this was a nice move. Furthermore they didn’t trade Matt Duchene or Gabriel Landeskog. No doubt offers were made but Joe Sakic didn’t want to undervalue the few remaining good players by getting less than they’re worth.